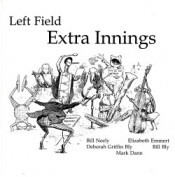 After migrating to New York City in my youth to seek my musical fortune, I co-founded Left Field, along with Liz Emmert, Bill Bly, and Deborah Griffin Bly. The four of us, often joined by Mark Dann, became known for our repertoire of obscure cover songs and original tunes covering a bewildering array of topics, delivered (in offbeat vocal arrangements with tight harmonies) with utter and happy disregard for stylistic consistency. We eventually developed a following of devoted listeners who came to hear us play at places like the Speakeasy in NYC and the Minstrel Coffeehouse in NJ. We also made several guest appearances on radio legend John Weingart’s Music You Can’t Hear on the Radio (103.3 FM Princeton and WPRB.com). John was an early supporter and was instrumental in helping us reach a wider audience. 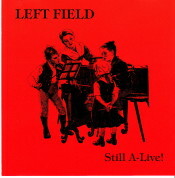 Left Field produced two recordings: a live album, Left Field: Still A-Live!, and Extra Innings, a studio recording of original songs. Prior to these, several of my tunes were recorded by Left Field for Fast Folk Musical Magazine, a monthly album of original songs produced by The Musicians’ Co-op (a/k/a the CooP) in Greenwich Village. Below, you’ll find the songs that I contributed to these recordings. We have a radio show “Soundings” on wdvrfm.org. It’s a small station out of Sergeantsville, NJ. Just want you to know we are playing “Media Ecology” tonight and will play more in the near future. Great stuff. Our favorite is “Thru Askin”….a real message and just beautiful music! Wish we could play it but you know…FCC. We have “Ballads, Bromides and Broadsides”. If you have anything more send it to “Soundings” c/o WDVRFM.org, PO Box 191, Sergeantsville, NJ 08557. WDVR can be streamed.